After suffering so much criticism for timidly remaining glued to his seat in the dugout at the Britannia, it was interesting to see Arsène up and down in his technical area, like a jack-in-a-box on Saturday. Even Podolski cast off his customary lethargy on the bench and was for once stripped off and standing on the touchline in an instant, when he was given the nod to come on for the last 15 mins. Like everyone else, I'd love to play Monaco or Porto but truth be told, the odds of us pulling one of the big three out of the hat in tomorrow's draw are fairly high (it's the price we pay for our negligence in throwing away a three goal lead at home to the likes of Anderlecht!). So with this in mind, as far as I'm concerned only Bayern would be a bitter disappointment. Not that the thought of facing Messi, Suarez and Neymar, or Ronaldo, Bale and Benzema isn't intimidating, but a lot can happen between now and February and while I would fear that psychologically, Bayern have got our number, I'd fancy that we would at least have a fighting chance against either of the Spanish giants. Meanwhile, no matter one's opinion about Wenger's wilful gamble with our gossamer thin squad (at least as far as the defensive front is concerned), it is essential that we retain some proper perspective. One of my Spurs mates has been a season-ticket holder at White Hart Lane for as long as I've been watching the Gunners and he's become so incensed in recent times with Levy's mismanagement that he's made the previously unthinkable decision to give up his seat for the remainder of the season. 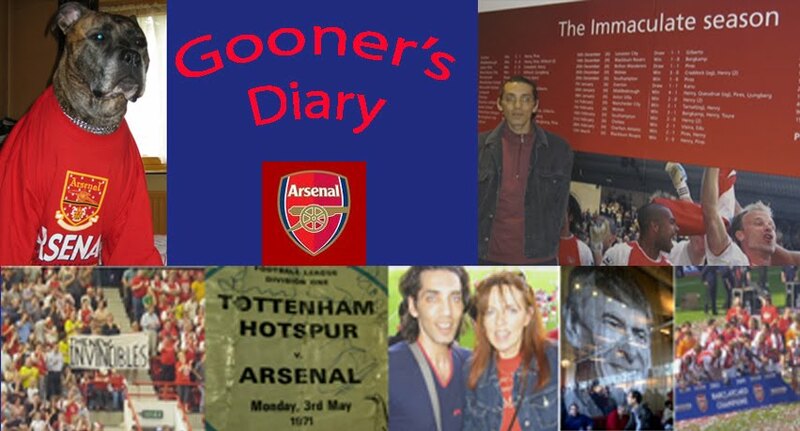 Myself I remain unconvinced, as if Spuds string together a couple of decent performances, I simply cannot imagine him choosing to sit at home for the North London derby, or him not going to any of the big games, as the excitement mounts towards the climax of the season (never mind their quarterfinal v the Toon in midweek!). I think that like myself, there were a lot of Gooners joining in with the chorus of “There’s only one Arsène Wenger” certainly not because our rampant display against Newcastle meant that all was forgiven and forgotten. You only had to hear the mutterings of discontent prior to kick off about our makeshift defence, to know that we were all decidedly unhappy about the fact that we were once again going into an important game, with only one recognized centre-half available for selection. It was hardly ideal that this time it was Debuchy who was forced to assume the crucial responsibility of partnering Mertesacker in the middle, with our French full-back only recently returning from his long enforced absence. My neighbour sarcastically cracked that we’d have Sanogo at centre-back next week! Yet despite our abiding anger over Arsène’s culpability in our lack of cover in defence, in our hearts, the vast majority of us are far too grateful to the man, to be able to suffer seeing him disrespected by the handful of ignorant yahoos who gave him the bird boarding the train back from Stoke. Saturday’s vocal demonstration of support for le Gaffer was by no means indicative of an Xmas truce. Football fans have become so fickle nowadays that Saturday’s convincing victory won’t prevent the level of disapprobation from being any less vehement, should we fail to beat QPR in our next home game. But for all the recent criticism and in spite of the increasing clamour for Wenger to walk, the core of all those of us who can still recall the woefully dour mediocrity of the Arsenal’s football in the era before Arsène (or more accurately, before Rioch signed Bergkamp) were intent on making it known to him and the rest of the football world that no matter how we feel about his competence, in return for what he’s done for the club and for all the joy he’s given us over the entire course of his long tenure, Arsène will forever be adored. In fact we set about the Toon with an intensity and verve that suggested our squad also had a point to prove about their staunch loyalty towards our leader, after letting him (and us!) down last weekend. Playing “with the handbrake off”, by contrast to the vast majority of our comparatively sedentary showings thus far, the Gunners were an irresistible force. Infused with the same irrepressible energy of Alexis, Bellerin was extremely impressive at right-back. And the robust vitality of the Ox was influential in the middle of the park. 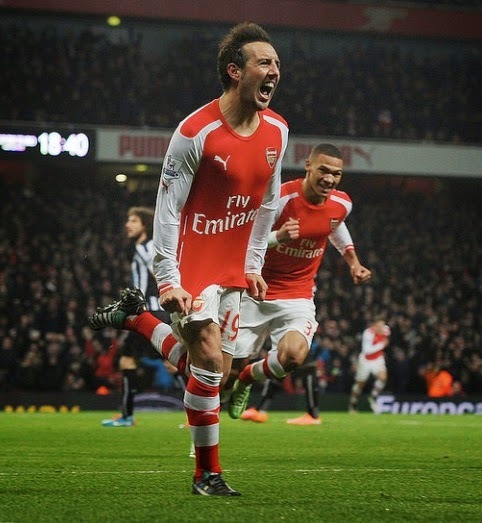 It was also brilliant to see Santi mark his 30th birthday with the rediscovery of his mojo. The somewhat astonishing sight of the tank like Tiote bouncing off the diminutive Spaniard was indicative of Cazorla’s desire to bring his influence to bear on proceedings. It was so refreshing to see him desperate to stay on his feet, hungry to secure our second goal, when Santi could've easily opted to hit the deck following the contact from Coloccini in the area. Especially compared to the irritating sight of all those Chelsea players going down like ninepins on Match of the Day later that night. This encounter might've been a whitewash if Welbeck had scored the brace of goals he deserved. Yet if I was a Newcastle fan I would’ve been disappointed with the Toon’s minimal efforts to take advantage of our panic-stricken defending. Personally I’ve still not got over the trauma of us being pegged back to 4-4 at St. James Park a few seasons back. Despite our dominance on Saturday, the defensive calamities we’ve endured in more recent times resulted in a slight air of anxiety, as we began to run out of steam and Perez took advantage of us going to sleep at another set-piece. Thankfully Santi put a supremely fitting cherry on the top of this long-awaited celebration of Wengerball and warmed the cockles of Gooner hearts, with his “Panenka” from the penalty spot. The Gunners new fitness guru has certainly got his work cut out, as our players continue to drop like flies. But if Wenger can bolster our defence and with so many of our talented stars to add to Saturday’s mix on their return to fitness, it’s good to be going into the festive season feeling so much more optimistic. Now if only we can avoid Bayern, Real and Barca in the Champions League draw, it will feel as if Santa has turned up prematurely.